Product #16310 | SKU ECMVG1 | 0.0 (no ratings yet) Thanks for your rating! 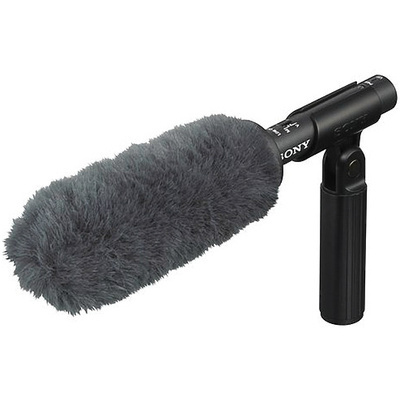 The Sony ECM-VG1 Electret Condenser Shotgun Microphone is a rugged, all-metal short shotgun microphone with a supercardioid polar pattern, making it a well suited choice for camcorder-mounted and boom pole operation alike. The included windscreen has been designed to maximise wind-noise rejection. The windscreen's rigid construction creates space between the microphone and outer part of the windscreen, minimising the transfer of energy from the windscreen to the microphone itself. Also included are a microphone boom mount, spacer, 2 stand adaptors and a short XLR cable. A low-cut roll off switch further minimises low-frequency noise due to wind noise, mechanical noise and proximity effect. The ECM-VG1 requires external 40 to 52V phantom power, and is terminated with an XLR output connector.